Qatar has become the alliance’s newest member, thanks to a rash move by the Saudi Crown Prince. Kaleidoscopic changes in West Asia have produced a constellation of power posing fresh challenges to the United States. The emerging alliance among Russia, Iran and Turkey gained its newest member in Qatar, thanks to a rash move by Saudi Crown Prince Muhammad bin Salman. Most alarming for America: Turkey is the North Atlantic Treaty Organisation’s easternmost member with the second largest military in the defence partnership. Qatar provides the Pentagon’s Central Command with its forward base, the region’s largest. The alliance is by no means the result of expediency. The elements undergirding it – geopolitical, economic and ideological – have long been in the making. It has been helped sharply by President Donald Trump’s muddled foreign policy, a contrast from the coherent policies of the Obama administration with its commitment to democracy and human rights. Trump’s repeated statement before foreign assemblies – “We are not here to lecture you [on] how to run your countries” – is too vague to form the base of Washington’s policy in international affairs. Even that mantra fails when Trump lectures Iran’s elected rulers on how to govern. Iran’s strategic importance was highlighted on November 27 when Turkey, Iran and Qatar signed an agreement naming Iran as transit country for trade between Qatar and Turkey. The move undermines Saudi efforts to isolate Qatar. This is also true of Qatar. Since his bloodless 1995 coup against his father Emir Khalifa Al Thani, Emir Hamad Al Thani has focused on ensuring that his tiny sheikhdom does not become a vassal of Saudi Arabia. To give Qatar a high international profile, he set up the Al Jazeera television channel in 1996, staffed largely by BBC-trained journalists. When the Saudi ruler refused to let the Pentagon use its state-of-the-art airbase near Riyadh for its air campaign against Afghanistan after the 9/11 attacks, Hamad struck a secret agreement to let the Pentagon use the Al Udeid airbase, reinforcing Qatar’s links with Washington to deter Riyadh from attempts to dominate the emirate. To supplement this strategy with a regional power outside the Arabian Peninsula, Hamad signed a defence-industry cooperation agreement with Turkey in 2007 and a military training agreement in 2012. The next year, he abdicated in favour of his son Tamim. In March 2015, the parliament in Ankara passed the Turkey-Qatar Military Cooperation Agreement. Four months later, Tamim informed Saudi King Salman of the true extent of the accord – basing 3,000 Turkish troops in Qatar for training and joint exercises. The monarch reportedly welcomed the deal as a counter to Iran’s growing regional influence. Almost two years later, with the ascendancy of Prince Bin Salman in Riyadh, the Saudi-led axis of four Arab countries demanded that Qatar “immediately terminate the Turkish military presence in Qatar and end any joint military cooperation with Turkey inside Qatar”. The demand backfired. Ankara sent more troops to Qatar, and its tanks rolled through Doha, lending political and moral support to Qatar. The top demand of the Saudi-led Axis for Qatar – “Curb diplomatic ties with Iran and close its diplomatic missions” – ignored a critical economic element. The emirate shares a vast gas field in the Gulf with Iran. Overall, Saudi Arabia has ignored Iran’s geopolitical strength. Iran has shorelines on the Persian Gulf, Arabian Sea and Caspian Sea and shares land borders with Pakistan, Afghanistan, Turkmenistan, Armenia, Azerbaijan, Turkey and Iraq. It has ample reserves of oil and gas. It shares a fluvial border with Russia in the Caspian Sea. In August 1992, Russian President Boris Yeltsin’s government signed a contract to construct and operate a civilian nuclear plant near the Iranian city of Bushehr. After long delays, the facility started producing electricity in 2013. Later, Iran and Russia signed an agreement to build two new nuclear reactors at the Bushehr site, with an option of six more at other sites. 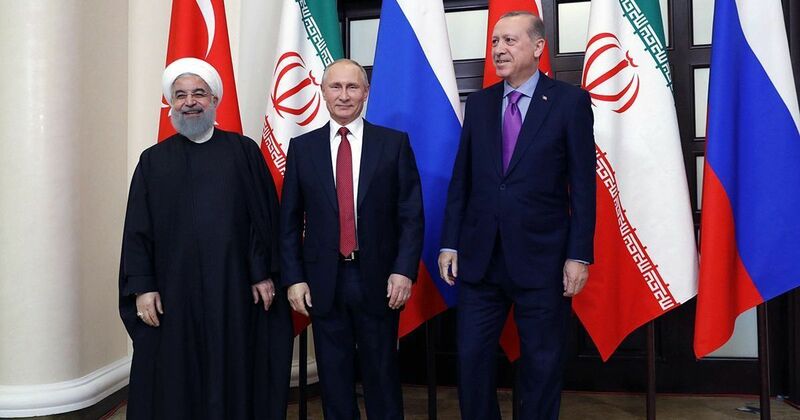 During protracted negotiations between Tehran and six global powers on Iran’s nuclear programme, Russia favoured a moderate line in contrast to the hard line advocated by France with the United States taking a middle position. Military cooperation between Moscow and Tehran started in 2007 when Iran inked the $900-million contract for five Russian S-300 missile batteries. Delivery started three months before the landmark July 2015 deal on Iran’s nuclear programme, with Russia shipping an upgraded version of the S-300. In September of that year, Russia intervened militarily to bolster President Bashar al Assad of Syria where Iran had been aiding his government with weapons and armed volunteers in the civil war. This led to Moscow and Tehran regularly discussing military planning for Syria. Russia’s Vladimir Putin and Assad share the view that groups raising arms against an established government must be termed terrorists. Strategically, Putin was keen to maintain a base in the Syrian port of Tartus to maintain a Russian naval presence in the Mediterranean. In November 2015, Putin attended the summit of Gas Exporting Countries Forum in Tehran. While meeting with Putin, Iran’s Supreme Leader Ayatollah Ali Khamenei reportedly praised his interlocutor for “neutralising Washington’s plots”, adding that economic relations between the two countries could expand. To his delight, Putin relaxed an export ban on nuclear equipment and technology to Iran. In an unprecedented gesture, Tehran let the Kremlin use its Hamadan military base to launch aerial strikes on a range of targets in Syria in August 2016, enabling the Russian air force to cut flying time for warplanes and increase payloads. The following April, Sputnik News reported that Moscow and Tehran were considering the sale of Russian fighter jets to Iran and a joint venture for Iran to manufacture Russian helicopters under licence. Turkey ranks 17th in the world for gross domestic product, yet has no energy resources of its own while sharing borders with hydrocarbon-rich Iran and Russia. As early as 1996, Turkey signed a natural gas contract with Iran starting at 2 billion cubic meters in 2002. In 2008, Turkey and Iran inked a memorandum of understanding on natural gas production and export. This envisaged Turkey investing in the development of Iran’s gigantic South Pars gas field and pipeline construction to deliver Iranian gas to Europe via Turkey and also supply the Turkish market. Once the United Nations and the European Union lifted sanctions on Iran in January 2016, there was a spurt in Turkey’s imports of Iranian oil. During the first seven months of 2017, Turkey imported 7.4 million tonnes of crude, up from 3 million tonnes for the corresponding period in 2016. In February, Putin ratified a deal to build the 1,100-km Turkish Stream pipeline, foreseeing three decades of Russian-Turkish collaboration, to transport Russian gas across the Black Sea into Turkey and southern Europe. The news came weeks after the successful co-chairing of peace talks for Syria’s civil war by Russia and Turkey, backed by Iran, in the Kazakh capital of Astana. On the eve of Trump’s inauguration in January, Moscow sent a last-minute invitation to the United States. The incoming administration sent its ambassador in Astana as observer. After Trump moved to recognise Jerusalem as the capital of Israel, Erdoğan warned that the United States is “plunging the region and the world into a fire with no end in sight”.